As part of our initiative with Center for Neighborhood Technology (CNT) to install 100 rain gardens in Rogers Park, we are moving forward on planting one right in the backyard of our Koinonia Eco Home. Last week, the rain garden project crew met up with CNT Senior Engineer Bill Eyring and his daughter to investigate further. We determined the back corner of the yard to be the best fit for a garden based on the location of the rain spouts. Scoping out the rain garden spot. 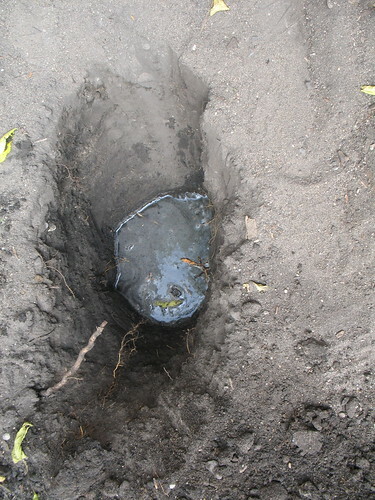 The first step in preparing our rain garden is directing the path of the rain water. We will do this by digging out the corner of our yard to create a low-lying area which we will then bank with the extracted dirt. This low-lying area will then be filled with a variety of deep-rooted native plants which will absorb any storm water stopping it from causing any flooding to our property or washing debris into our waterways. CNT has graciously donated over 70 plants for us to use to create our rain garden. Hopefully, we will have more pictures and updates to share soon! 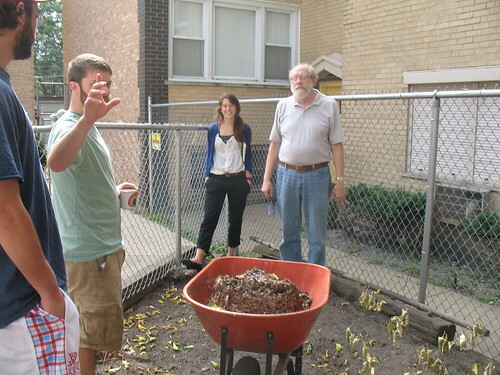 This entry was posted in Koinonia Eco Home, Rain Gardens by letsgochicago. Bookmark the permalink.